Cold feet can turn the happiest of people into cranky, miserable monsters. Anything from wet socks to freezing airplane cabins and drafty bedrooms can turn your lower extremities into freezing, numb, cumbersome bricks. A quick and easy way to avoid the compulsive need to flex your toes every few minutes is to invest in a cozy pair of travel slippers. That way you can keep your feet clean, warm, and comfortable during the longest and coldest of journeys. Having a good pair of travel slippers can help you feel luxurious, even if you’re staying a hostel. Plus, they help you avoid getting dirty. Invest in one of the following pairs of travel slippers and never silently wonder if you are suffering from the early stages of frostbite again. These travel slippers are simple and small, fitting over your feet like socks. The acrylic blend of the slipper is super soft and warm, and the slip-resistant bottom keeps you safe from unexpected spills. The top of the slipper stretches to accommodate different sized feet. You can choose from four fun and whimsical colors. They will fold down easily to fit in your carry-on luggage, which makes them a great thing to use on a long, chilly flight. These slippers feature an open toe and an open heel, which offers valuable ventilation for anyone who likes a warm foot, but not a sweaty one. They are actually designed for travel and fold up into a compact little-zippered case so that they can be kept together. They can be stored conveniently in any purse, backpack, or other carry-on items. The non-slip soles make them safe to wear on almost any surface, and the soft, odor-resistant, high-grade SBR material will fit snuggly around your foot. 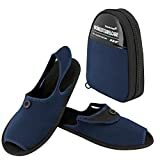 This is a great choice for anyone looking for travel slippers that pack away quickly and easily. These low profile little slippers almost look like SCUBA socks. They are made of high-quality neoprene, which will keep your foot warm and clean. These travel slippers also feature a skid-resistant sole, which will keep you safe, and a sleek design that look like sports socks. 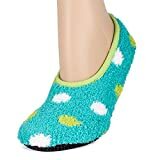 If you want the comfort and coziness of a slipper when you travel but are too bashful to wear classic slippers on a train, plane, or around a hotel, these travel slippers that are disguised as cute shoes are great options for you. They are too delicate to be worn outdoors, but resemble women’s shoes so much that you may be surprised by how cozy they are once on. One reviewer emphatically sang their praises, stating that they are comfy, snug, but not too hot or tight. These travel slippers are a great choice for anyone who wants the slipper experience without rocking the slipper look. These look more like classic slippers. They cover your toes and foot but open in the back which makes them easy to slip on and off. These travel slippers are thin and low profile, with a 65% cotton/35% polyester blend, and a slip-resistant bottom. They come with a narrow little travel bag that fits them both snugly, ensuring that they will not get separated in your luggage. They are also machine washable. If you wind up wearing them on some questionable surfaces during your travels, you can keep clean by just washing any grime away as soon as you are home. These slippers come in five classic color options, and are super convenient overall. 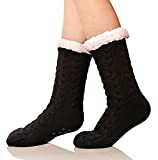 If you are super prone to cold extremities and are looking for something that covers your whole foot along with your ankle, these slipper socks are a great solution for you. They rise to about halfway up your calf and will keep your entire foot, ankle, and lower leg warm and cozy with their ultra-soft fleece lining. They have slip-resistant beads on the soles, which will keep you safe and upright. The soles also keep them foldable and storable with no hard rubber sole to navigate. The attractive cable-knit pattern is very stylish. With ten different color options, you can select which pair most speaks to you. 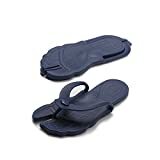 If you like slippers best because they keep your feet off of the ground, but you do not really care about keeping warm, then these foldable flip-flop slippers are the perfect travel companions. They store complexly flat, but the heel of the shoe lifts off of the back and hooks into a support between your big and second toe to transform it into a flip-flop. It is not unlike those temporary flip-flops they give out to clients at pedicure salons, though they are much sturdier. They are lightweight, non-slip, and easy to store. What more could you want in travel slippers? Which of These Travel Slippers Are You Packing? So the next time you are facing a colder climate, a long plane ride, or even just a night somewhere unfamiliar, make sure you have a trusted pair of travel slippers with you to keep your feet clean, dry, and warm throughout your journey. If you want to keep your feet extra happy, avoid blisters and check out our picks for the best walking shoes and compression socks.